ESPN’s global coverage of Special Olympics World Games Abu Dhabi 2019 began with live coverage of the Games’ Opening Ceremony and continues every night this week with Special Olympics Winter Games Abu Dhabi 2019. 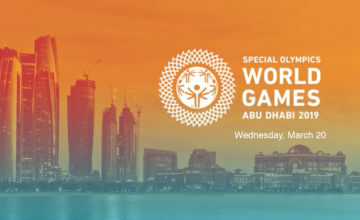 Hosted by ESPN’s Kevin Negandhi, the program originates on site in Abu Dhabi and includes interviews, features, special guests, a daily competition showcase segment and contributions from ESPN’s Julie Foudy, Jen Lada and Gene Wojciechowski, as well as ESPN contributor and Special Olympics Ambassador, Daina Shilts. Michelle “Angel” Athenas: An athlete who was non-verbal for much of her youth and abused in the foster system. Angel was adopted at 8 years old and is now flourishing. She has a huge personality and is full of confidence, which led her to four gold medals in powerlifting at the USA Games in Seattle. Arizona Unified Basketball Team: A close group of athletes and partners, who have seen their lives changed by Special Olympics. Gerald Mballe: A refugee and unified partner with the Italian 7-a-side soccer team, sits down with Kevin Negandhi to talk about the power of inclusion and unified sports. Competition highlights include swimming, handball, basketball (with Massachusetts native Matt Millett’s ¾ court shot), golf, soccer, cycling (Kiera Byland’s quest for a 3rd gold) and track (including Minnesota native Chris Tucker in the 100M dash). ESPN Images is capturing photos from around the Special Olympics World Games throughout the week, including those below.